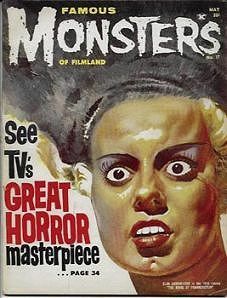 May 1962 issue of Famous Monsters with the Bride of Frankenstein on the cover. Front and back covers are loose, but otherwise the issue is in excellent condition. Elsa Lanchester portrayed the Bride and also Mary Shelly in the movie. She was the real-life wife of actor Charles Laughton. Website design and hosting by Sohodojo Business Services. Item 144 of 466 items displayed in viewer. 0 items in cart.